Forgive the late post am not sure quite where the morning has gone, but its gone nevertheless! As you all probably know I am not the greatest fan of minimal interiors, I tend to prefer filling rooms with stuff no matter how big or how small the room maybe. I’m particularly taken with creating little nooks all over the house, which I can use to sit, work, flick through a mag, research and so on. Mini home offices if you like that don’t look like home offices – which brings me nicely onto the subject matter of the day ‘Adding some zing to your home office’. You can plonk a home office anywhere any little nook will do the big trick is to soften with stuff in order not to make it look and feel a fish out of a water. I went to someone’s home office a while back(will not mention names) which was in the box room (nothing wrong with that), except all it had in it was one desk, chair, computer, printer, filing system and one overhead light. White paint, beige maybe pale grey carpet I think not sure as had a funny turn and had to get out quick. Shouldn’t our homes be a reflection of who we are and shouldn’t we be surrounding ourselves with things we love? Lets talk about adding zing. Pictures over desks, maybe the odd mood board propped up or some fab wallpaper or a bookcase, shelves anything that tricks the eye and holds it’s attention meanwhile distracting from the more officey stuff below. Lamps on tables are fab they cosy it up and add another layer and layers as I’ve said maybe a zillion times add interest. As for the desk any old table will do,Â I’ve converted an old claw footed dining table into my desk I just sprayed it teal rather than leaving it brown not a big fan of brown furniture. I’ve softened it up with books (serious art tomes, plonked an old wooden head on top sporting my latest sunglasses and wham bam its there). 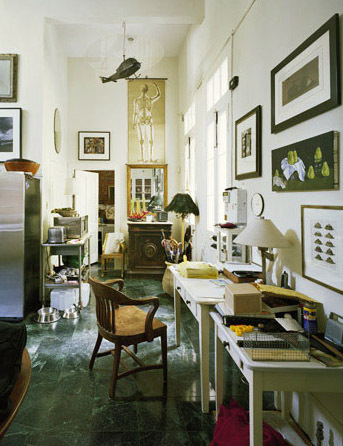 Shelves also make fab desks I remember seeing Martha Stewart’s apartment in NY yonks ago and she converted the smallest little nook into a work area – her desk was really a shelf with shelves and books above, beautiful. I also gravitate around the houseÂ with the ipad so I have lots of little perching nooks – the console in the hallway, the console on the lower ground floor, the kitchen island and what is fab about all of them is that they have the same vibe as my desk – candles, books, lamps, art – comforting, homely stuff that makes work not feel like work. 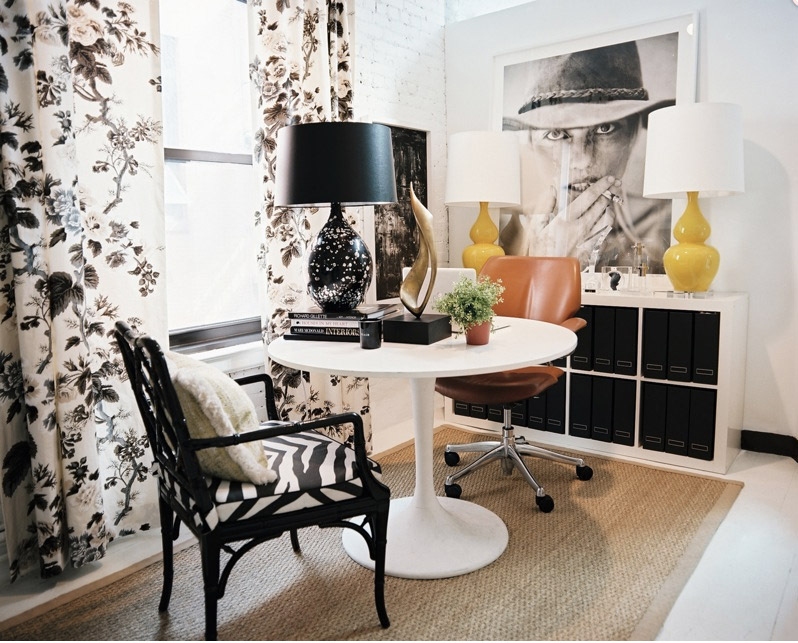 This is one of the offices at lonnymag.com, simple yet clever. Opposite the office chair an impromtu chair for meetings, its upholstered its not officey and it sets an interesting tone. Lamps on desks are a must the bigger you can go the more drama you add and love the idea of stacking them on book to ramp up the height. Finally my home office or studio, three lights – floor, table and gnome (! ), heaps of books, zebra rug skimming the floor and a floor to ceiling bookcase and I love it!